Today's post is about the continental knit stitch. 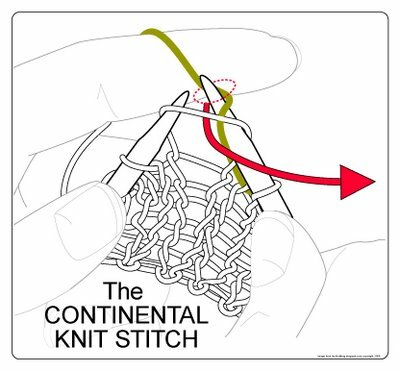 It is the first in a four-part series, which includes the continental purl stitch, the English knit stitch and the English purl stitch. 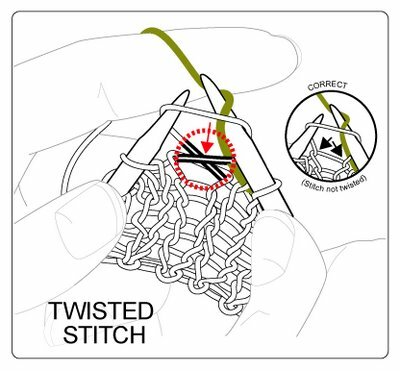 The right needle inserts into the stitch at the tip of the left needle, and catches the standing yarn (green) "up from under." 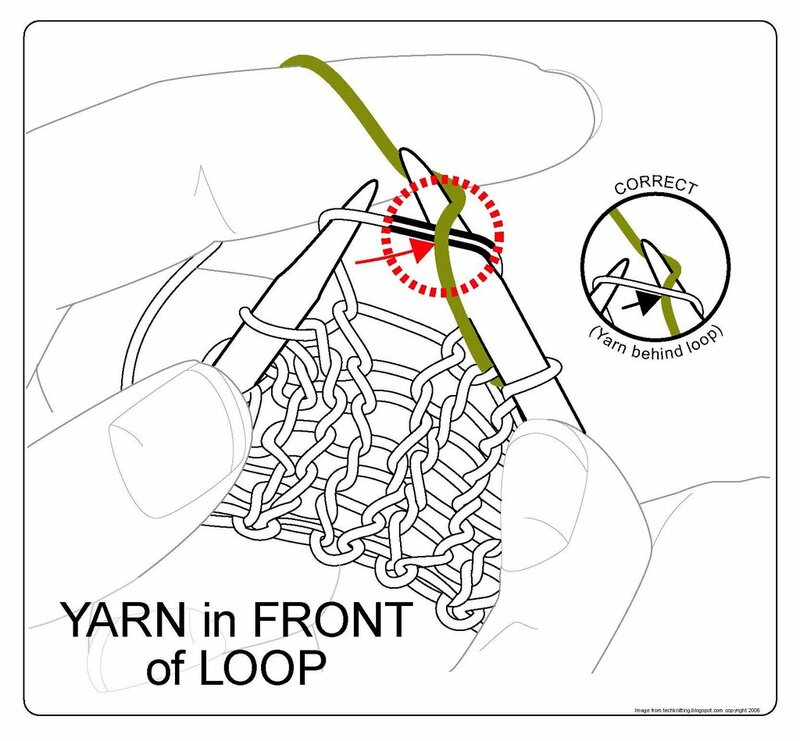 The tip then travels out of the loop along the path of the red arrow carrying the snagged standing yarn, which enlarges and becomes a new loop on the right needle. 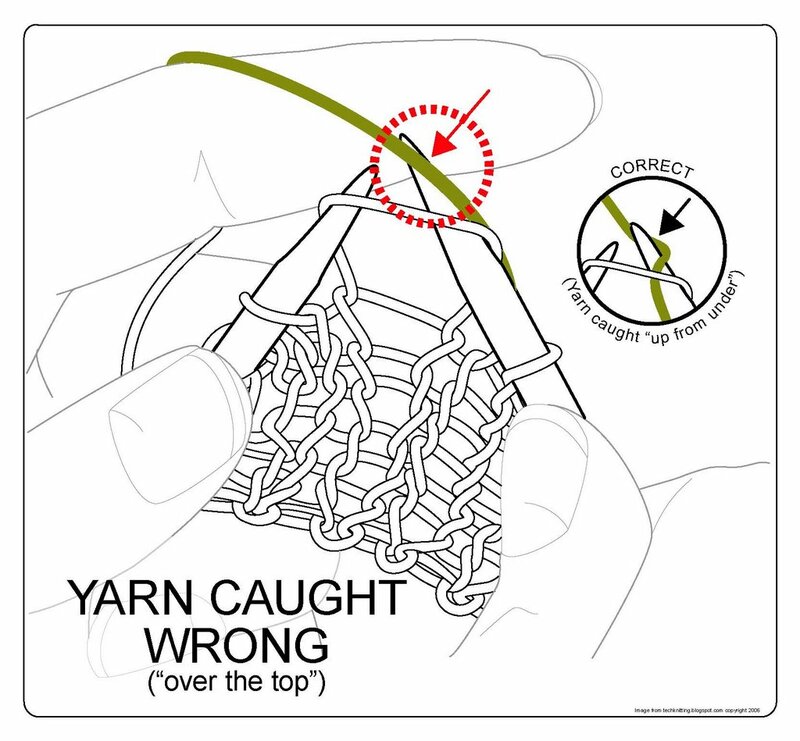 If you think about it, a lot of things have to happen "just right" for a stitch to be created and lie correctly on your needle--the stitch you're knitting into had to be made correctly, you have to position the standing yarn in the right place, the tip of the right needle has to be correctly inserted into the stitch and the right needle has to correctly snag the standing yarn. Something can go wrong with each of these steps, and generally does when you're first learning. 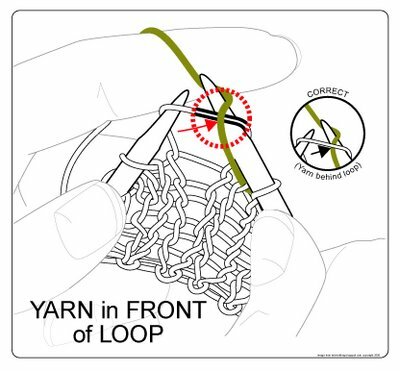 You won't get too far with this mistake--it's too hard to catch the standing yarn if you've held it in front of the left loop while trying to snag it from the back with your right needle. That doesn't mean you won't drive yourself nuts trying, though. 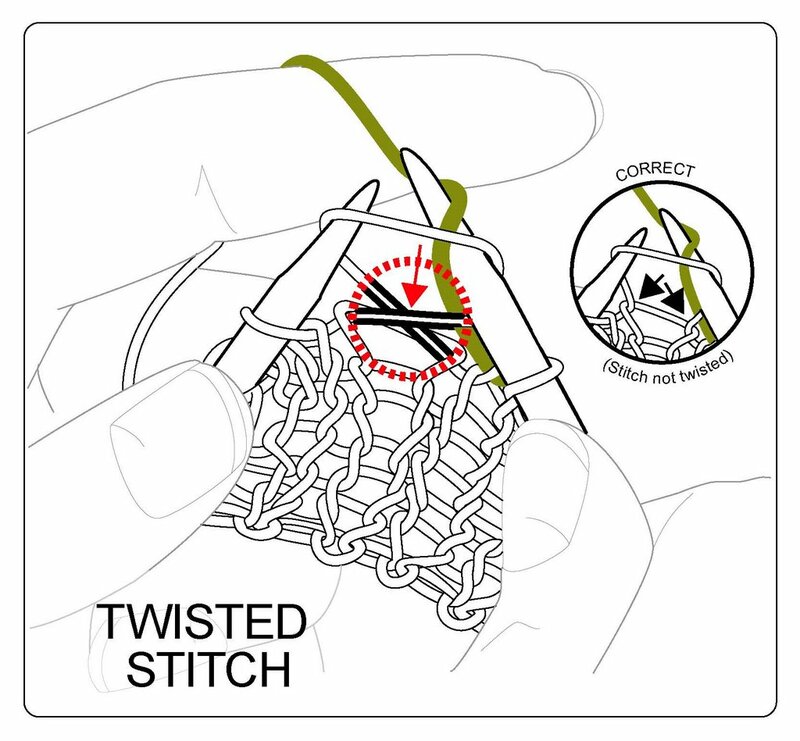 There are two ways to create this problem: Either the stitch was already sitting twisted on your left needle when you got there (because you inserted the tip of the right needle wrong when you made the stitch on the row below), OR you inserted the right needle wrong on this row (the correct way to insert the right needle into the left stitch is from the front, over the right arm in a left-to-right "hooking" motion .Either way you got there, though, if you see something happening like the illustration above, you've got a problem. Take it out and do it again. 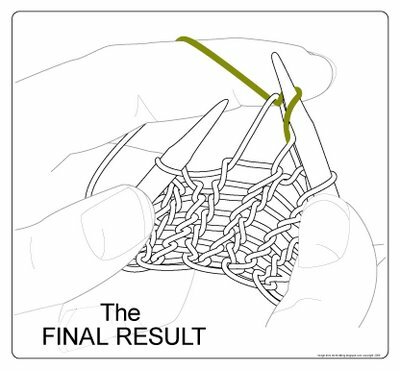 This, too, is a very popular error, especially when you first learn to knit, what with learning to control the needles, the yarn and your non-dominant hand (all at once). 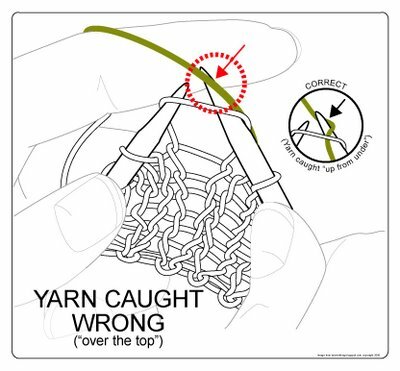 It's easy to make the mistake of catching the standing yarn "over the top" instead of the way it should be: "up from under." If you see this, take it out and do it again. 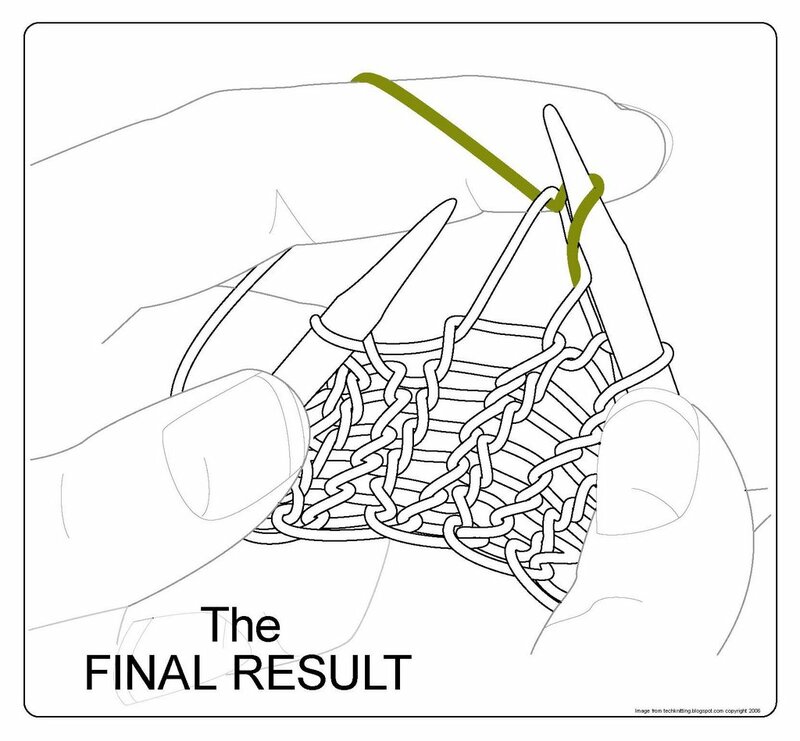 If you got everything just right, this is what the stitch should look like when you're done.